This course includes measurement demonstrations in the classroom. 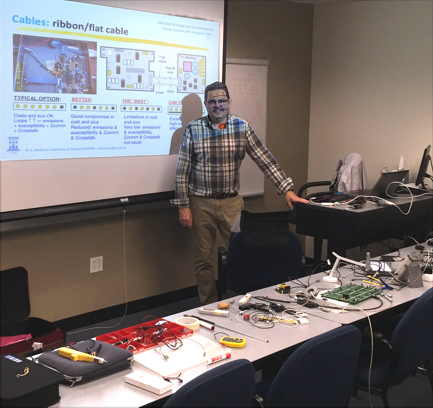 This special five day workshop covers the methodology of designing and/or troubleshooting an electronic product to minimize the possibility of electromagnetic interference (EMI), signal integrity (SI) and/or Electromagnetic Compatibility (EMC) problems. The basics of designing electronic products with EMI, SI and EMC in mind are introduced in a very understandable and entertaining style. The course is intended to cover the material from courses #243 (Signal Integrity and EMI Fundamentals) and #230 (EMI/EMC Design and Troubleshooting) as a comprehensive program including examples and simple experiments. The course presents the ways in which an electronic system can generate and/or receive EMI, thereby causing failure to meet EMC regulations. A practical approach with many real world examples, techniques, simulation and hardware tools for EMI/SI design will be explained to minimize costs, production and marketing delays by considering key factors and techniques in the design phase. No prior EMI/SI knowledge is needed but an electrical engineering background (BSEE or equivalent experience) is recommended. DAY 1 is dedicated to the BASICS OF EMI/EMC/SI including coupling mechanisms, why to consider EMC, typical sources and victims, time domain vs. frequency domain, near vs. far field, non ideal components, controlling signal return currents, differential vs. common mode currents, radiation and pickup from loop and dipoles, the “hidden schematic” idea, etc. Scattering parameters (s-parameters) are presented as a very useful set of parameters for experimental characterization and design. DAY 2 is dedicated to a review of COMPONENTS IN THE HIGH FREQUENCY/speed domain. TRANSMISSION LINES are explained in a very practical approach as a way to control signal propagation and impedance. Finally, MATCHING techniques are explained with many examples to obtain optimum power transfer and to avoid reflections. DAY 3 is dedicated to the basics of SIGNAL INTEGRITY in electronic circuits including undesired effects, propagation time and delay, reflections and ringing, crosstalk (near and far) and jitter. Delays. Jitter. After SI basics, a key topic is presented: GROUNDING. Signal ground versus safety ground, grounding strategies, ground loops, techniques to minimize ground impedance are discussed. Finally principles of FILTERING are explained: reflection vs. dissipation, source and load influence, damping resonances and ringing, insertion losses, components and layout in filters, ferrites, decoupling and bypass, mains filters, filter mounting and layout. DAY 4 covers the DESIGN OF PCBS, component selection and placement, special components for EMI (e.g. spread spectrum clocks), typical problems, layers (how many and distribution), layout, traces, transmission line effects, ground planes, splits in planes, decoupling (how, where, distributed, resonances, etc), crosstalk and examples. We will cover the topic of SHIELDING: influence of material, shielding effectiveness, low frequency magnetic fields, how to destroy a shield, holes and slots, gaskets, evaluation of shields, shield penetrations (how to do). DAY 5 is dedicated to CABLES from EMI/SI point of view including how they can radiate or pick-up (they are antennas), shielded cables, cable grounding, connectors, types of cables (wires, twisted pairs, coax, shielded cables, ribbon cables, etc) and their influence in the EMC profile of the product. A review of TRANSIENTS and protection (including ESD basics) is presented. Finally simple instrumentation and DIAGNOSTIC AND TROUBLESHOOTING TECHNIQUES for EMI/EMC/SI problems are discussed. understand the basics and fundamentals of EMI, EMC and SIGNAL INTEGRITY (SI) issues. look at high frequency fundamentals of EMI/SI, modeling problems to propose solutions. design electronic equipment to avoid common EMI/EMC/SI failures. use EMI diagnostic and troubleshooting techniques to locate and fix EMI/EMC problems in completed equipment designs. locate and fix EMI/SI/EMC problems in a product or installation. perform simple prequalification EMC tests. reduce time and cost of EMI/SI diagnostics and fixes. design engineers/technicians from the electronics industry involved in EMI and SIGNAL INTEGRITY (SI) problems. those interested in a working knowledge of EMI/SI engineering principles and concerned with EMI/SI problems as high speed digital designers, RF designers and PCB layout engineers. managers responsible for design, production, test and marketing of electronic products. marketing engineers who need a general and practical knowledge of the EMI/SI basics. design and test engineers/technicians from the electronics industry involved in EMI/EMC/SI problems. Analog, digital, RF, mechanical and system engineers and technicians interested in design process to avoid EMC problems. those interested in a working knowledge of EMI/EMC engineering principles and concerned with EMC regulations. laboratory personnel involved in measurement and troubleshooting of EMC failures. marketing engineers who need a general and practical knowledge of the EMI/EMC basics. The World is not Ideal. Are You Ready to Protect Your Circuits?